With its $5.6 million opening day and projected $18 million 3-day weekend gross in China, The Hobbit: An Unexpected Journey has become the third major Hollywood film in a row—after Skyfall and Jack Reacher—to fall short of expectations in its mainland theatrical release. In its first two days Hobbit managed only a distant second place finish behind the Chinese language hit Journey to the West, which has been in release for two weeks, and its attendance pattern over the course of the weekend suggests a relatively soft theatrical run ahead. To be sure, an $18 million weekend in China is not in and of itself a bad result. Not many pictures, Chinese or foreign, reach that level in their first three days in the PRC. But for a global phenomenon like the Hobbit, which has grossed nearly $1 billion in the rest of the world, this result comes as a surprise to the downside. 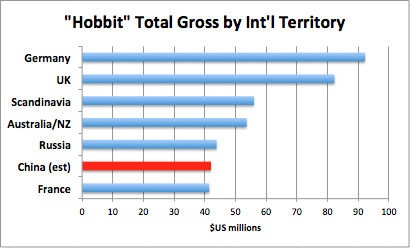 As the following chart illustrates, several much smaller territories will generate bigger total grosses for the film. Even given the context of the picture’s long-delayed opening and marginal post-holiday release slot, one could have reasonably expected Hobbit to at least match Skyfall’s total China gross of $60 million, but this now appears highly unlikely. Hobbit’s Friday-to-Saturday revenue bump was just 26 percent, among the smallest increases I’ve ever seen for a wide release in the PRC. A total gross in the low 40 millions is looking more probable, a figure that won’t even place the film in the top 20 releases in China this year. That number would be on par with the PRC performance of last year’s John Carter, a picture that grossed barely a fourth of what Hobbit did worldwide. 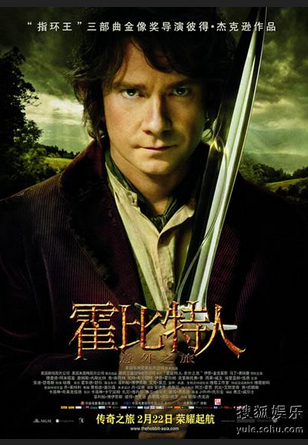 What is particularly troubling about China’s cool reception to The Hobbit is that it is a 3D fantasy film, a genre format that has consistently performed handsomely with Chinese audiences. Painted Skin 2, a poorly reviewed Chinese fantasy, earned $115 million in its 2012 China release, and Journey to the West has just reached $160 million and could well surpass Avatar‘s record $209 million China gross. Harry Potter and the Deathly Hallows: Part II earned $63 million two years ago, when China’s market was barely half the size that it is now. Journey 2: The Mysterious Island took in $60 million early last year, and Life of Pi grossed $91 million just a few months ago. What’s impeding the success of The Hobbit may have less to do with the film itself and more to do with the current mood of Chinese moviegoers. During the past few seasons they’ve demonstrated an increasing preference for Chinese faces in Chinese stories, and a growing impatience with Hollywood blockbusters which, rightly or wrongly, have been criticized for being too much alike. While it is far too early to sound the alarm for Hollywood’s movies in China, the recent trend ought to be cause for concern at the major studios. China will account for 10 percent of the global box office this year, and given that only those select few Hollywood films with the best perceived commercial prospects are allowed to release there, such releases ought to earn around 12 percent or more of their worldwide grosses in China. But Skyfall earned barely 5 percent of its worldwide gross in the People’s Republic, and The Hobbit will probably wind up at around 4 percent. If the next three U.S. releases—Les Miserables, A Good Day to Die Hard, and Oz: The Great and Powerful—turn in sub-par performances, then it may be time for the studios to heed the advice I’ve been freely offering for a long time: focus on what Chinese audiences want, and give it to them. Otherwise, the world’s fastest growing and soon to be biggest movie market will get along just fine without them. This entry was posted in Analysis, Opinion and tagged A Good Day to Die Hard, Avatar, China box office, Harry Potter and the Deathly Hallows, Jack Reacher, John Carter, Journey 2: The Mysterious Island, Journey to the West: Conquering the Demons, Les Miserables, Life of Pi, Oz: The Great and Powerful, Rob Cain, Robert Cain, The Hobbit: An Unexpected Journey by chinafilmbiz. Bookmark the permalink. What Chinese audiences want on the screen is Chinese faces speaking Mandarin. I doubt there are many one-size-fits-all films out there that can balance both Eastern and Western values. Perhaps what’s more realistic is to invest more in China to produce better quality films tailored for the local market.